Some weeks ago our good friend Matthew dropped a little factette in his Boozy Christmas Films piece that The Worlds End had had a special beer brewed specially for the film and as a celebration of the concluding chapter of the Blood and Ice Cream trilogy. Well after many months, I've finally managed to get my lips around a few bottles! I'm surprised it's taken me this long seeing as the Tring Brewery is quite literally round the corner from where I work. I know! I'm slacking! As I mentioned, Crowning Glory comes from the lovely folk over at Tring Brewery, the malt masterminds behind Sidepocket for a Toad and Ridgeway. The first thing I notice about this beer is that it's 6.5%, so just by looking at the label I can tell it's going to be a bit of a powerhouse. It's deep bronze colour is characterised by strong aromas of caramel, toast and orange. On the palate, its full bodied style instantly fills your mouth with orange zest and bitter lemon giving way to notes of caramel and sweet spices like cinnamon and nutmeg. The finish is a bittersweet symphony (HA! 90'S REFERENCE) of that ever present caramel and bitterness from the cascade hop. While this may be stronger than most beers, there's no excessive burn or salivation from the alcohol, which basically means you drink 4 and you're in trouble! 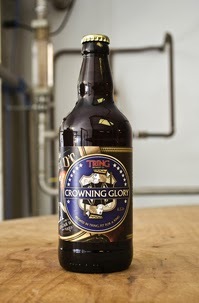 Crowning Glory is available from the on-site shop for £3 a bottle so if you're in the area, I urge you to pop in a grab a few of the offerings from Tring Brewery. Truly remarkable beer.